What's New at Tone on Tone? 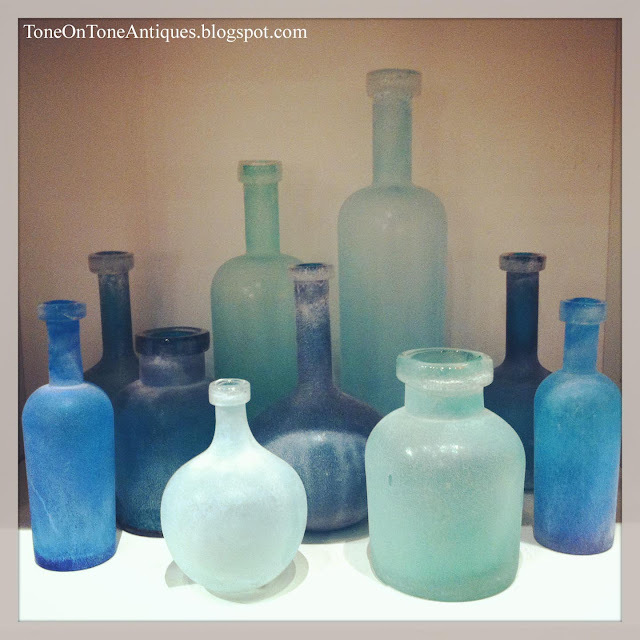 What's new at Tone on Tone? Or should it be what's old? :) Well, the container that came two weeks ago has FINALLY(!) been unpacked. Now I'm working on tagging, upholstering, setting up shop, and uploading photos to our website. Sorry for the delay. 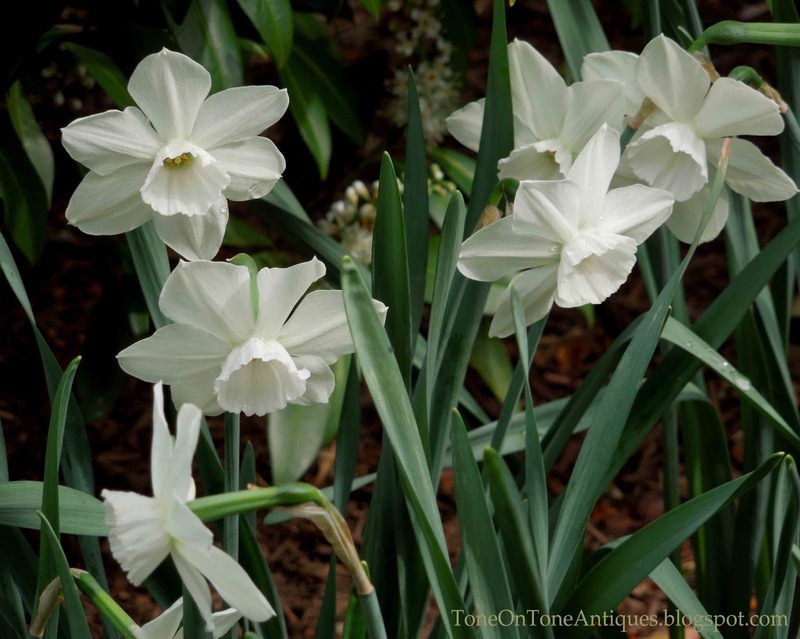 I've been swamped with multiple project deadlines and endless spring garden chores. 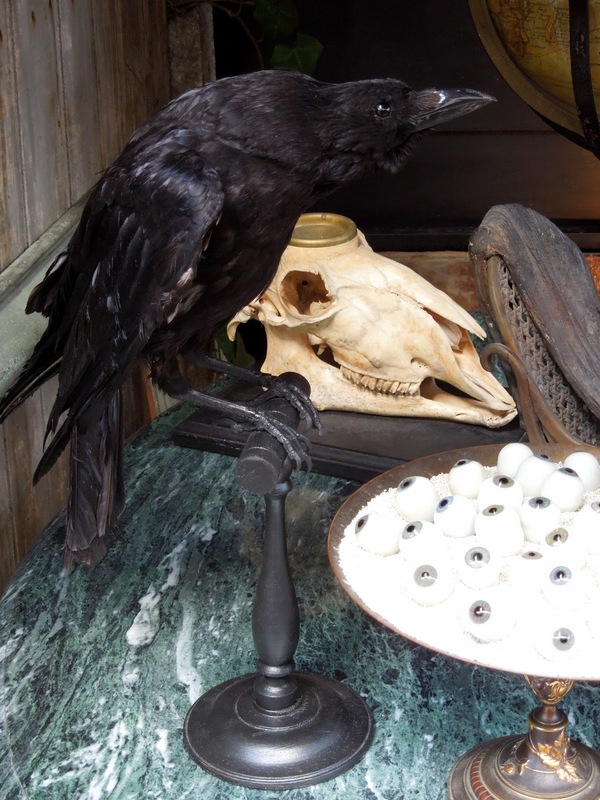 Here is a quick look at the shop and preview of a few new pieces. 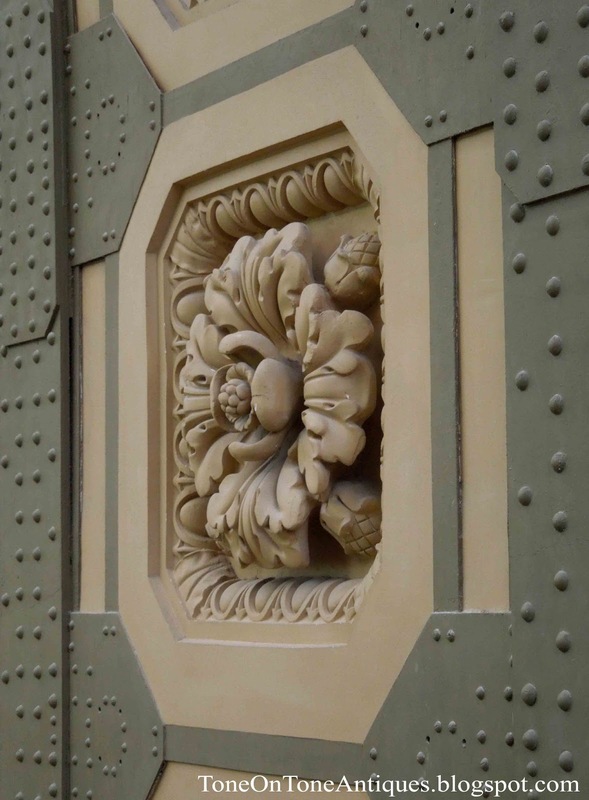 I'll be adding more photos directly to our website in the next couple of weeks. Thanks in advance for checking it out! 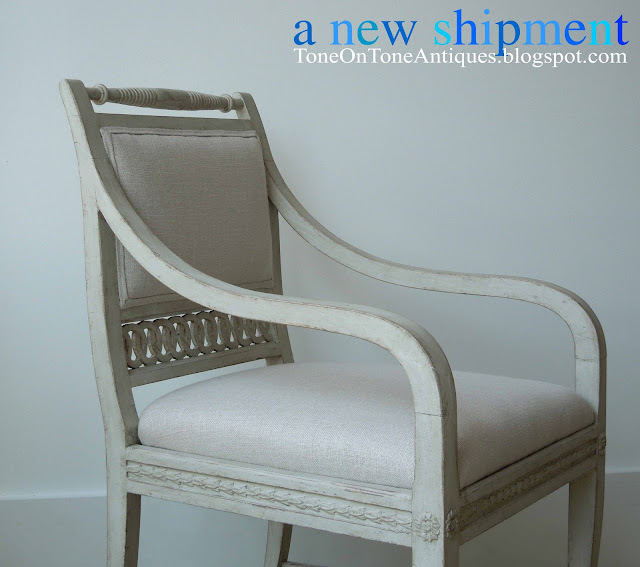 This pair of Swedish painted armchairs is actually from our prior shipment. 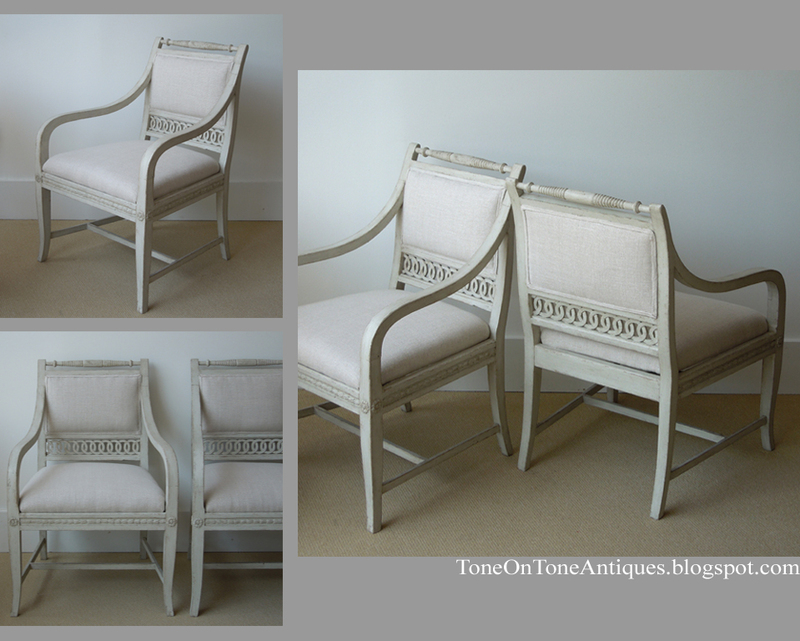 I had sent them out to the upholsterer, and they just came back with their new greige linen upholstery. 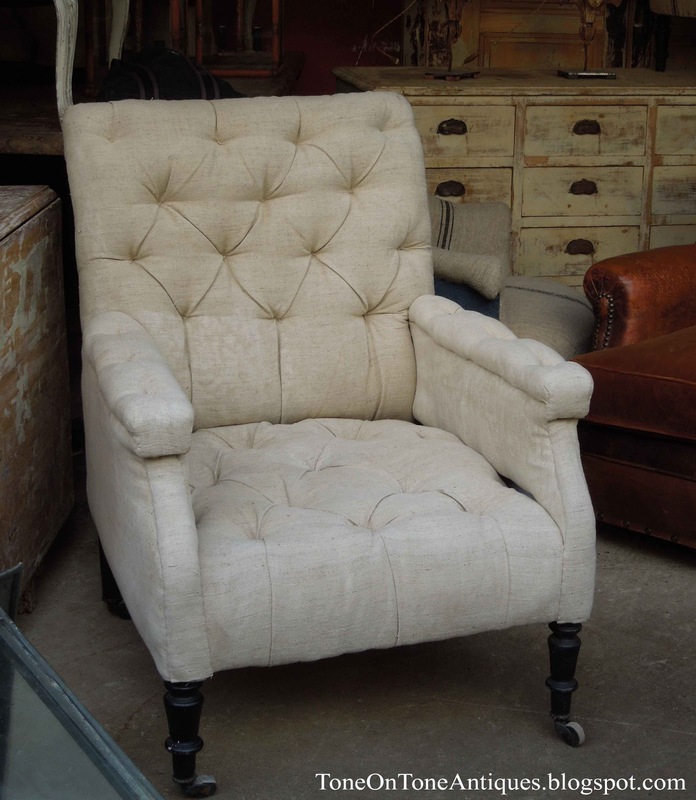 I love the downswept arms and pierced fretwork backrest. Above: A mix of Belgian, English and French pieces all in different finishes - just the way I like it! Anchoring this vignette is a mid 1800s French fruitwood farm table with a long end drawer (not shown). 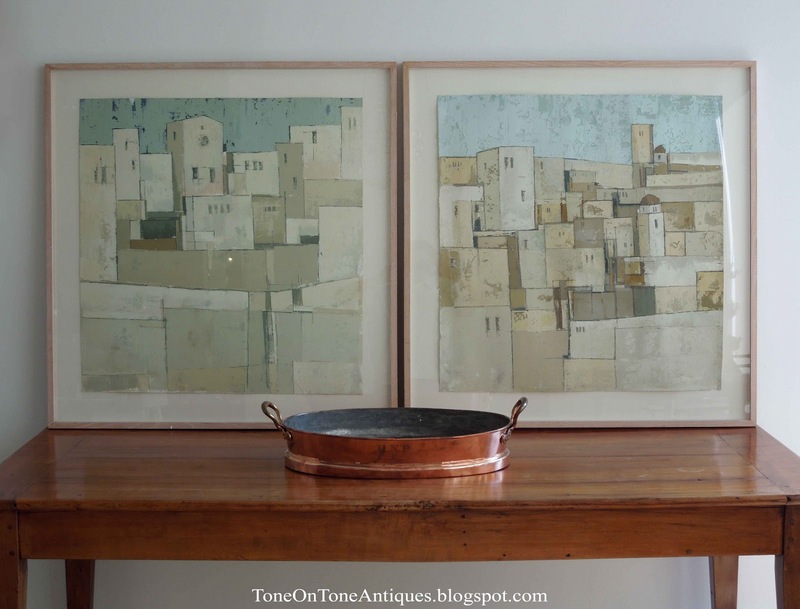 On top is a pair of 20th century oil and acrylic on paper paintings. 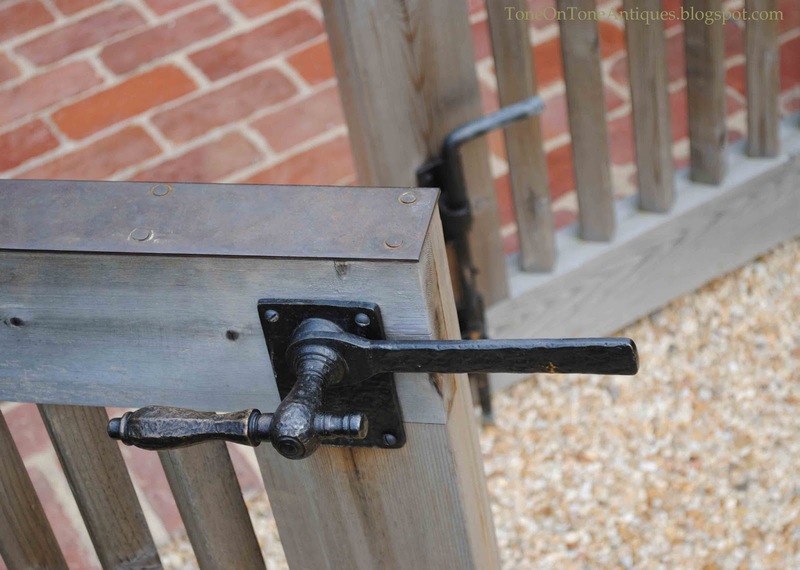 The centerpiece is a fabulous antique English copper fish poacher. 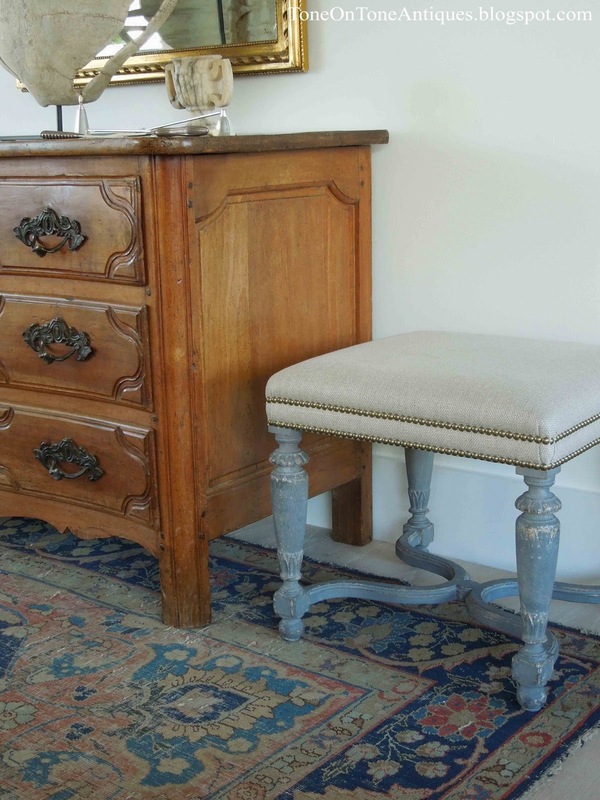 And the painted footstools, newly upholstered in linen with nailheads, are from Belgium. Another look at one of the stools next to a mid 1700s French walnut commode. The rug is 19th century Persian....just a bit worn and tattered. 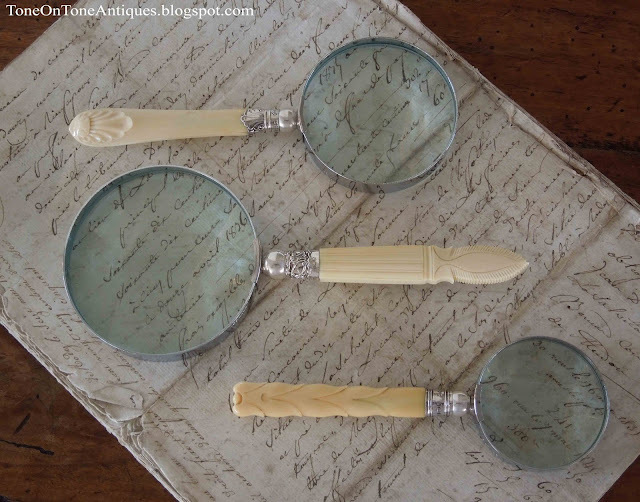 Lots of tabletop accessories in this shipment, including these antique English ivory accessories. 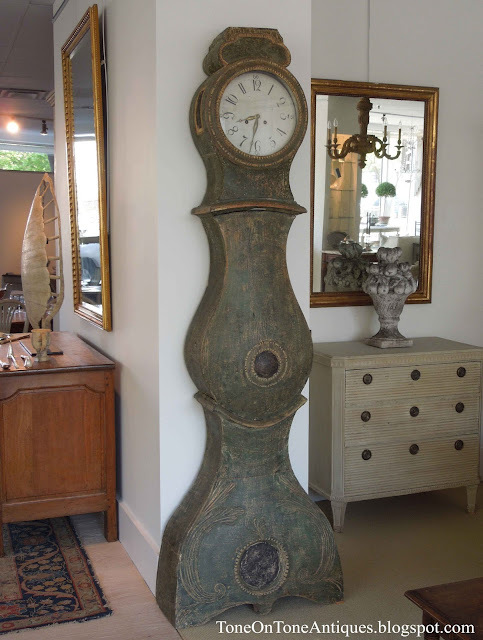 A couple of Swedish Mora clocks. 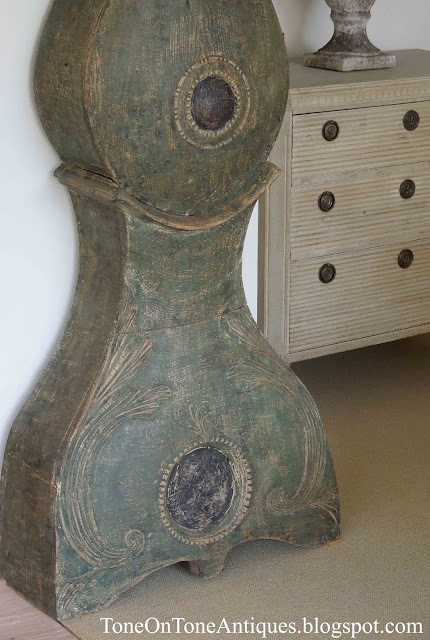 A sculptural Swedish bow front chest with three graduated drawers and cabriole feet. 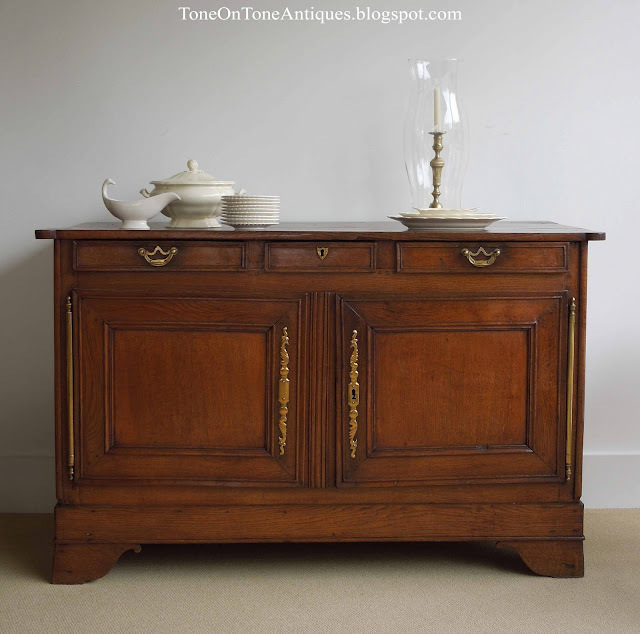 This French chestnut and oak sideboard with its fabulous long hinges and hardware just arrived. 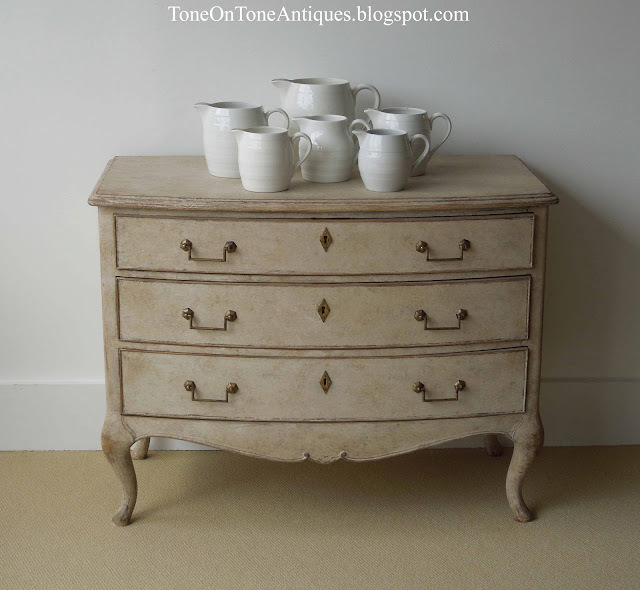 On top is a collection of creamware. 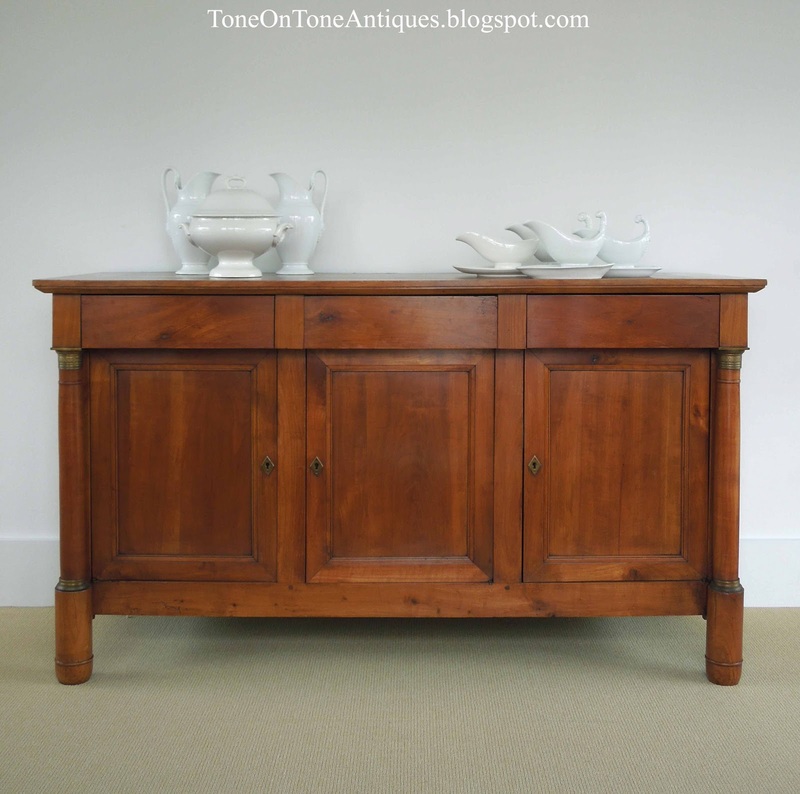 Below: A French Directoire style fruitwood sideboard with handsome proportions. All French here! 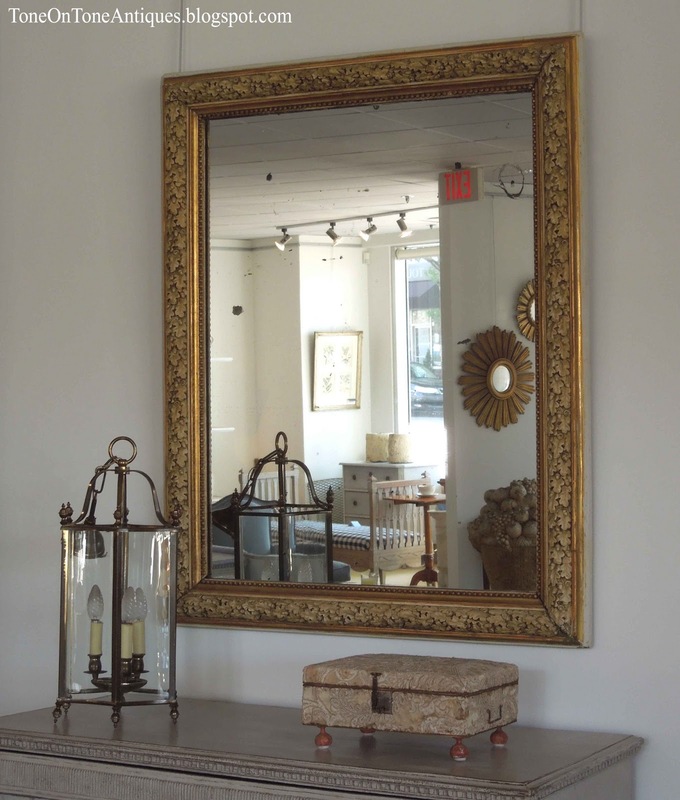 This type of French mirror is known as a bistro mirror. 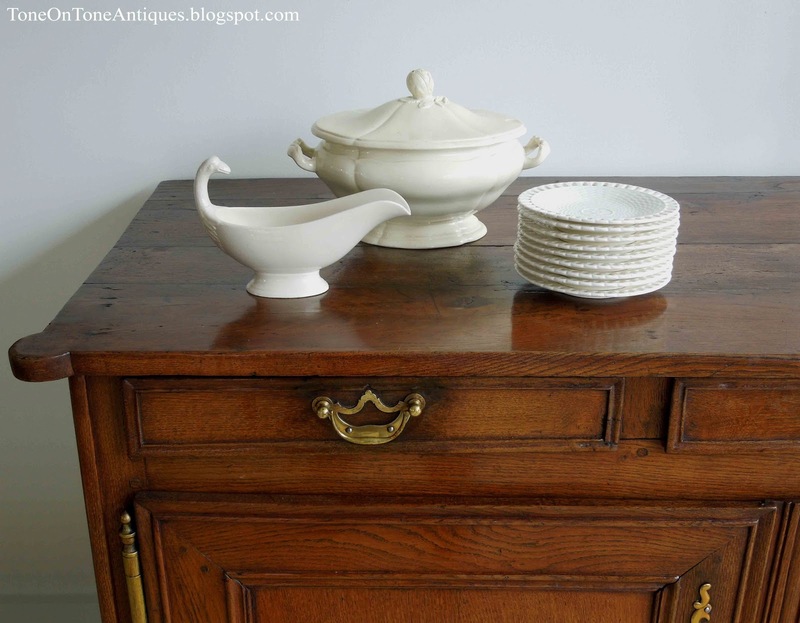 The flame top carved marble finials and soup tureen are also from France. 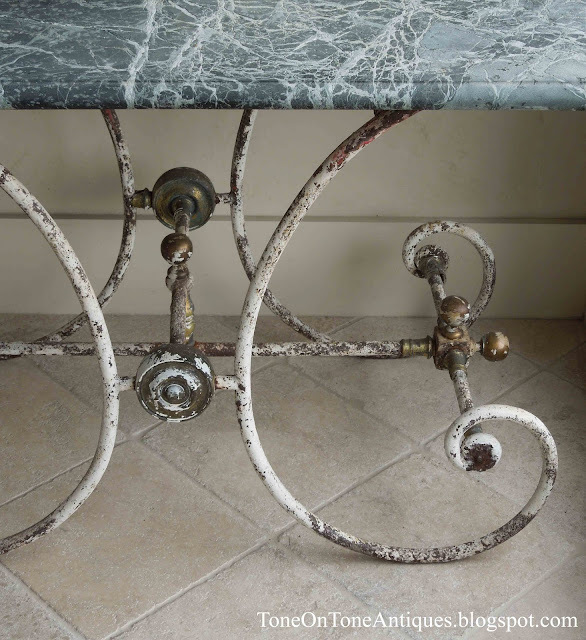 One of my favorite pieces from the shipment is this striking marble top pastry table with its old white painted iron base. 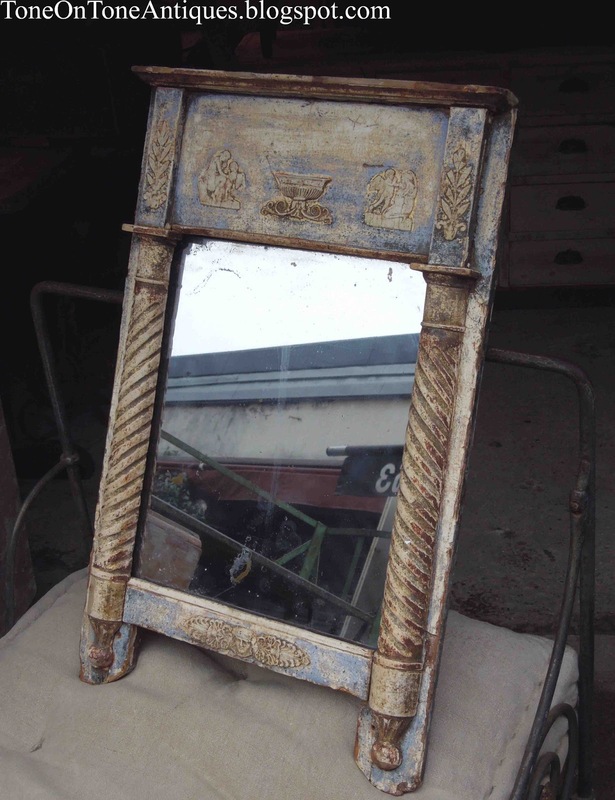 An antique English mirror with a frame of acorns and oak leaves. That's it for the shop tour! What else is new? I'm working on a lovely Ca. 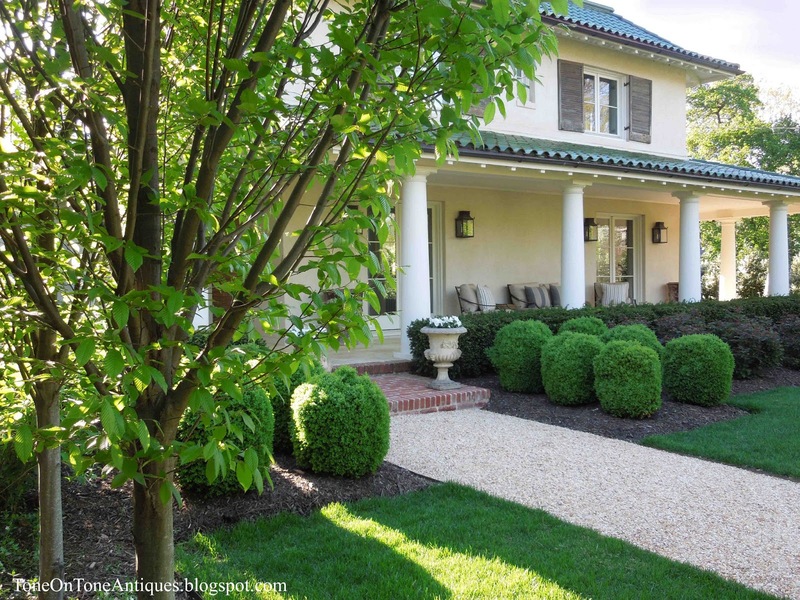 1860s home with this stunning conservatory addition. 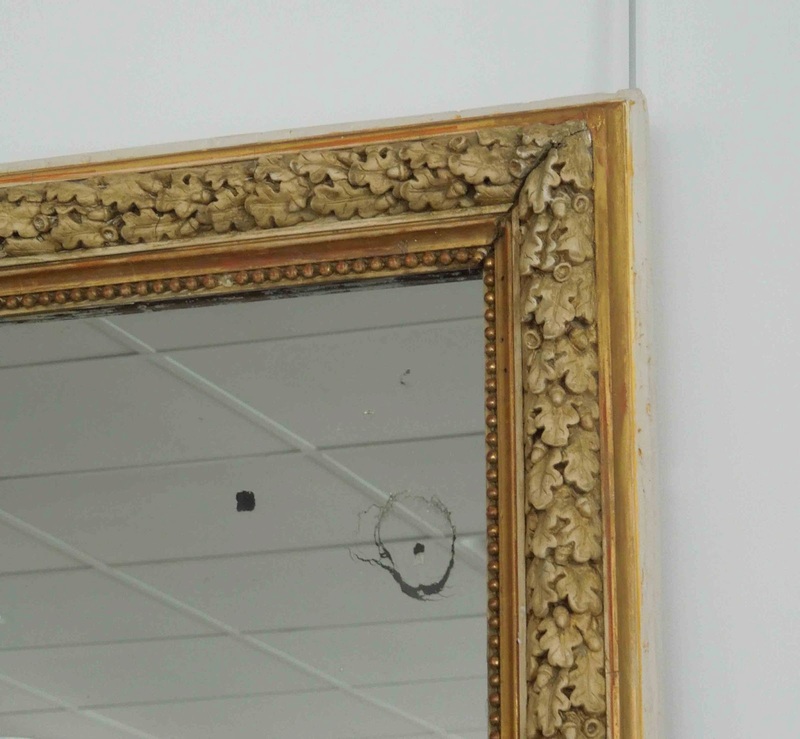 We are repainting the walls, ceiling and trim, and this photo was taken prior to painting. 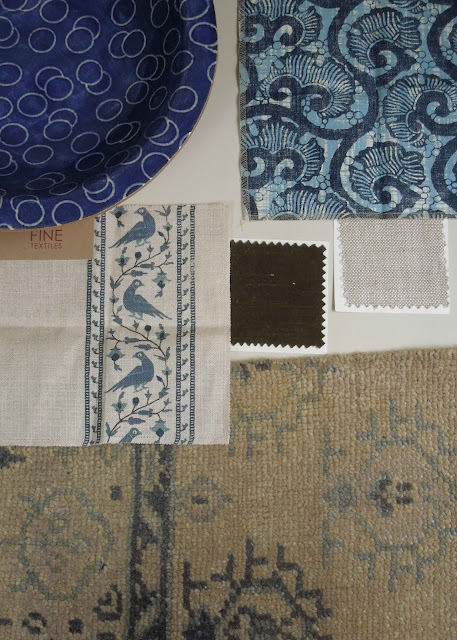 A peek at my board for the conservatory: many shades of blues, tans, browns and greiges. The pottery bowl is from John Rosselli. 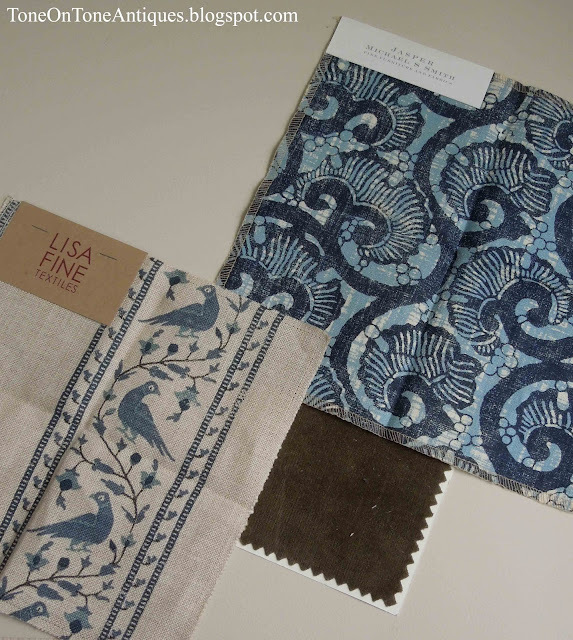 So are the Lisa Fine and Michael Smith fabrics. The wall paint color (background) is custom and the trim will be BM's White Dove. While shopping for pieces for the kids rooms, I came across this awesome collection of glass bottles at West Elm. Kinda reminds of a Morandi still life! It has been a while since I've posted about our garden.With the arrival of warmer weather, much is going on. 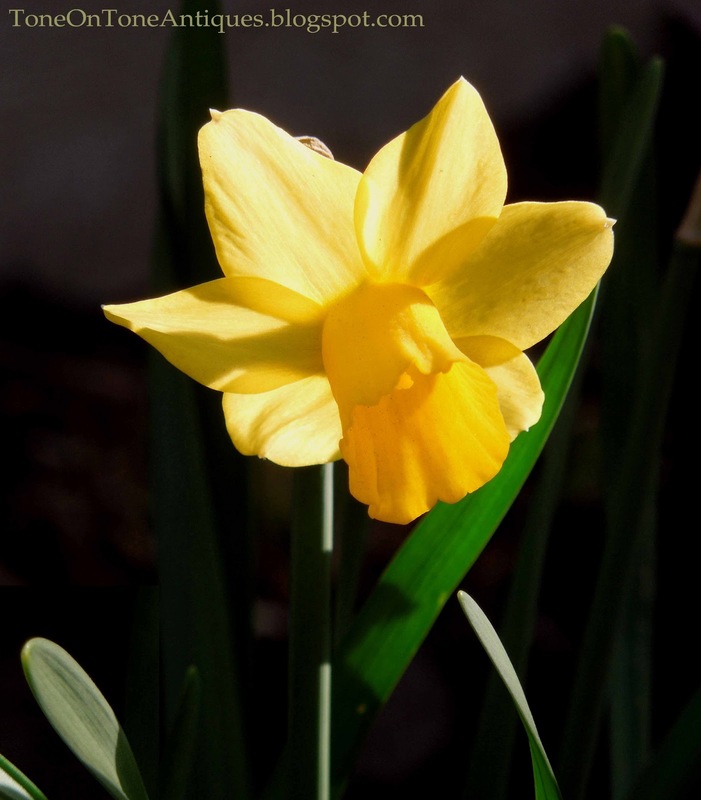 Bulbs are blooming, trees are leafing out, and perennials are popping up. 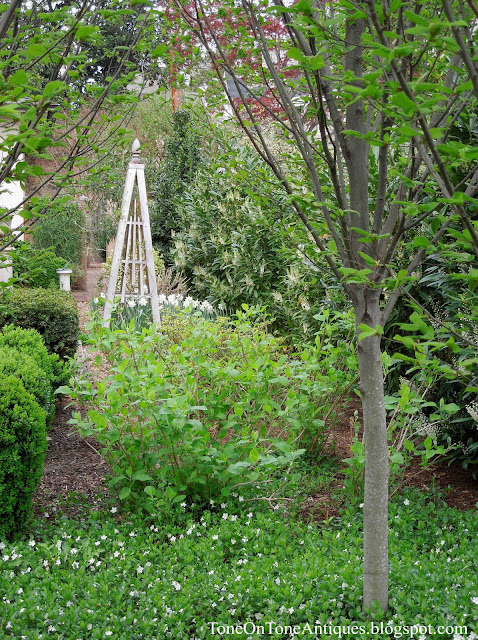 We've been busy seeding, planting, mulching, fertilizing, pruning, cleaning up, etc. Spring is indeed a very busy time, even in our small city garden. I like to start each day with a quick survey and walk to see what's changing outside. Here is a look at early spring in our garden. Pure sunshine in the small courtyard! 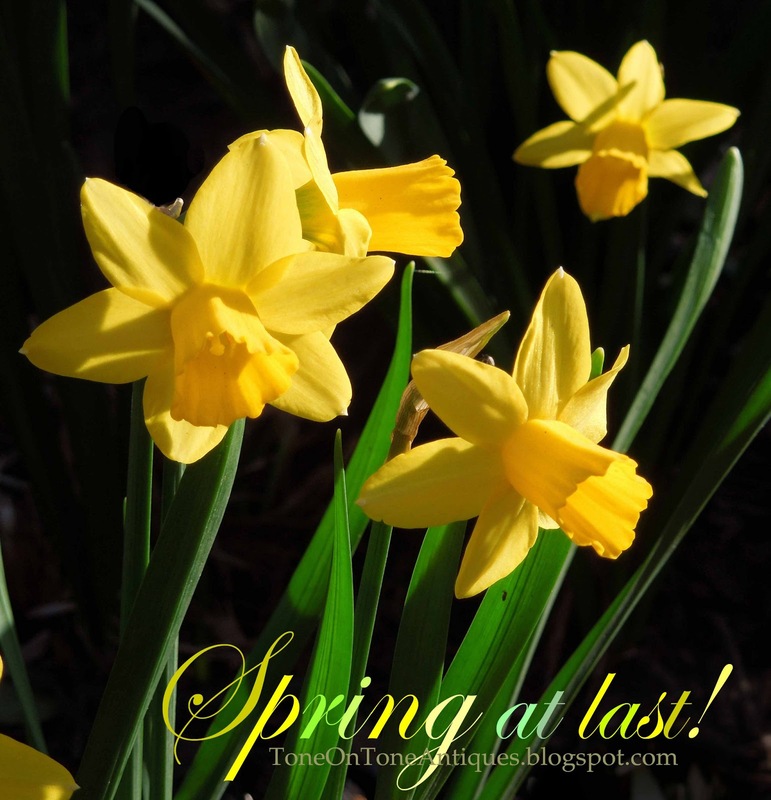 While yellow happens to be one of my favorite colors, I seldom use it inside or out. 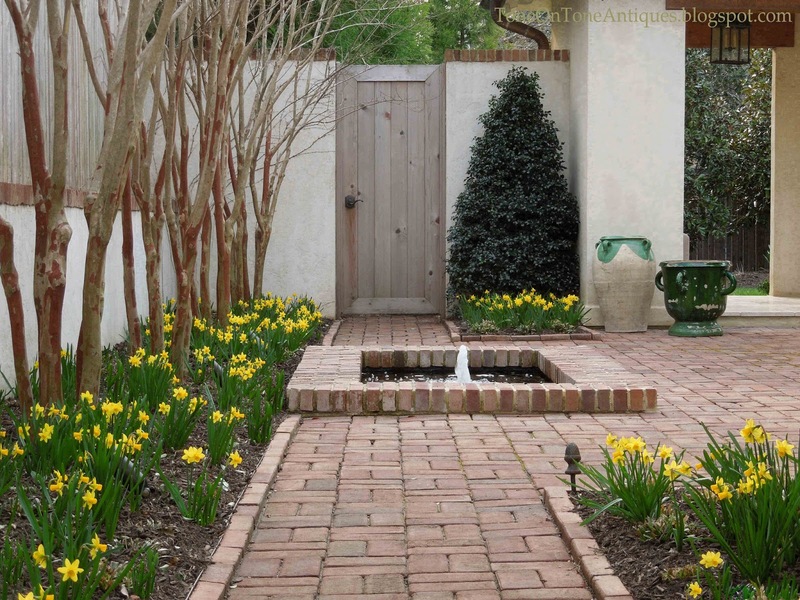 However, I made an exception here with Tete-a-Tete small yellow daffodils. 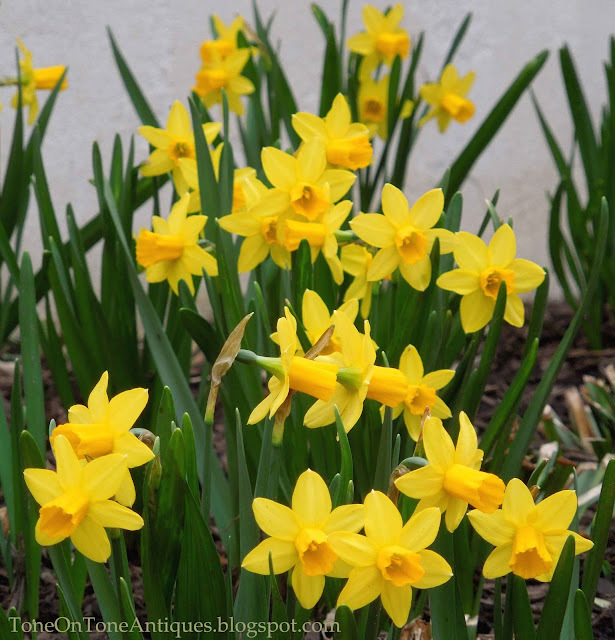 Tete-a-Tetes are early bloomers, and their bright yellow color is a fabulous way to kick off spring. 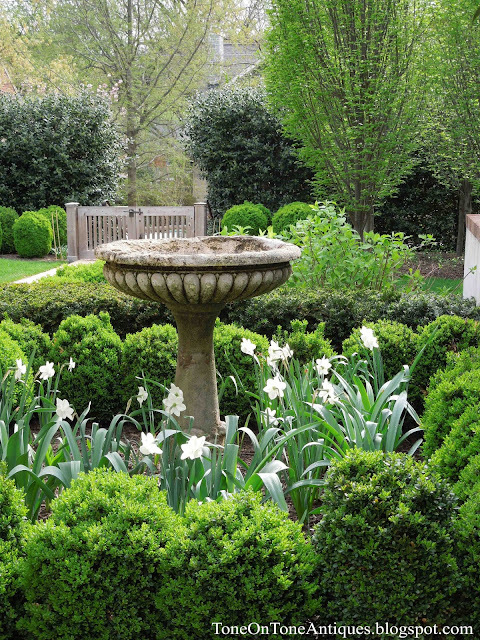 The little fountain finally got its spring cleaning. Tete-a-Tetes hold their blooms upright on sturdy stems. 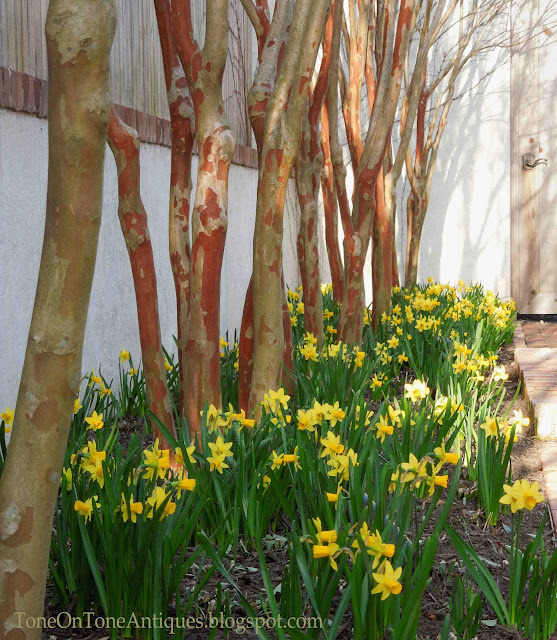 They bloom early before the Natchez crape myrtles leaf out. 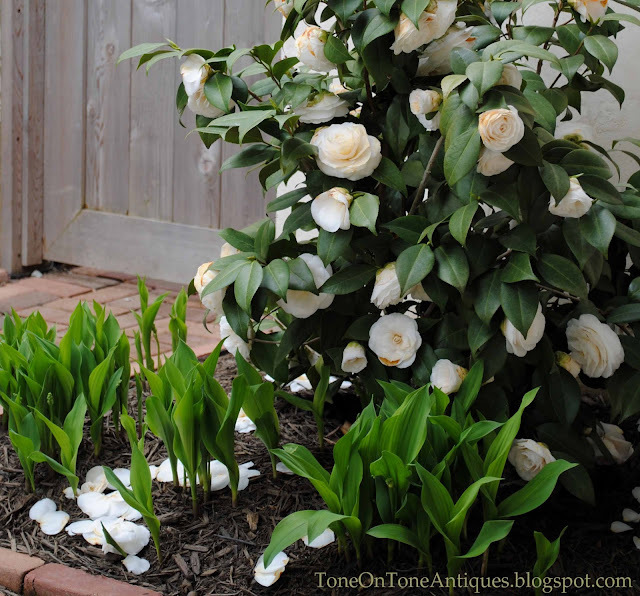 Next to the front door is this spring blooming camellia with double white flowers. I'm sorry I forgot the name. Anyone know? 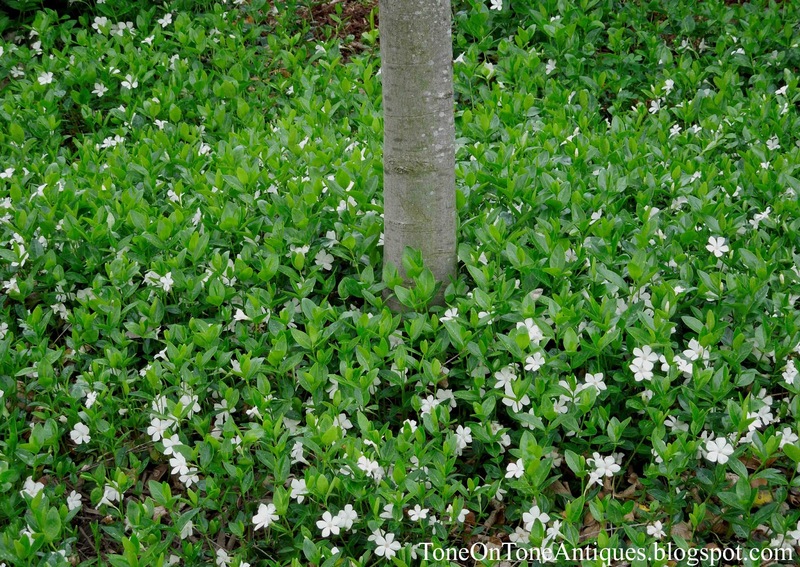 It is underplanted with white lilies of the valley dug from my friend Charlet's garden. So much to do! 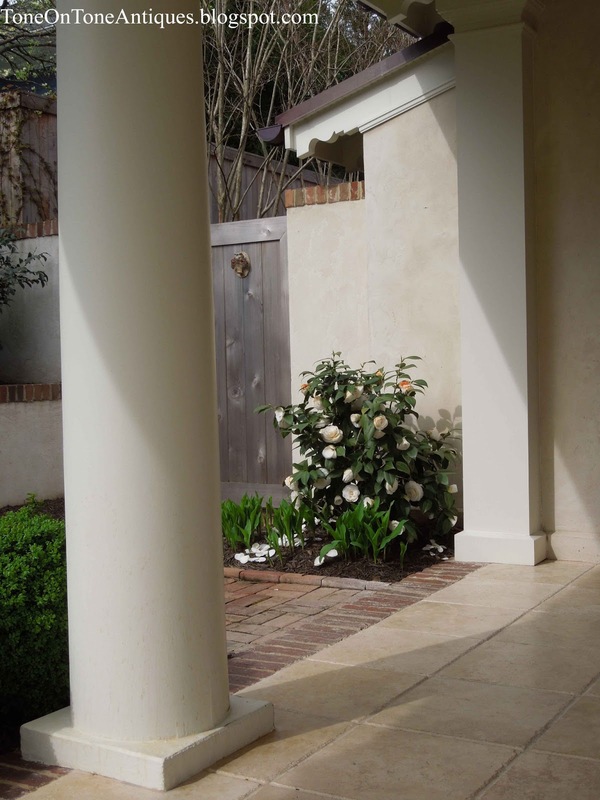 We planted pansies in the urns, and relaid the pea gravel walkway. 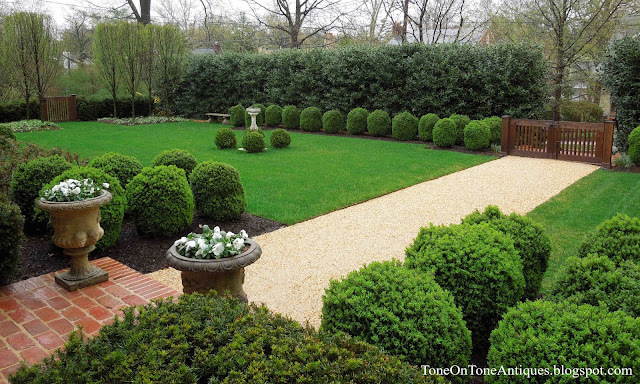 The walkway had become dingy, so we replaced the top 50% of the gravel and sand. We recycled the old gravel and sand to beds that needed better drainage.The below photo was taken right after a shower. Everything looks so green! Here the trees are just starting to leaf out. A few days later, fresh green foliage on the hornbeam trees. 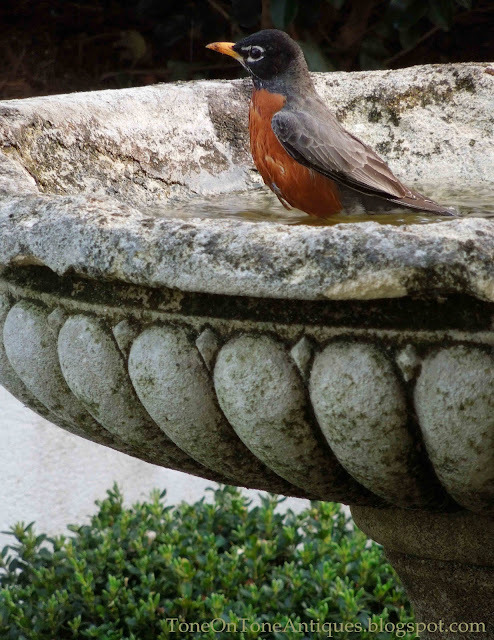 The birdbath was taken out of storage, and my garden companions have returned. Hi, there, little friend! This time of year, the house is still shading most of the white border garden. 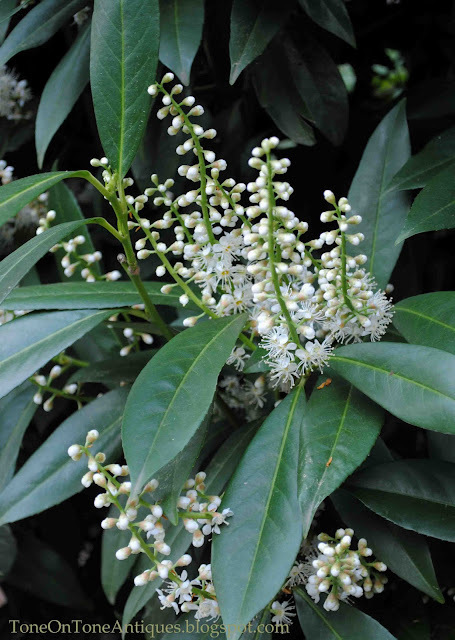 But look at the profusion of white flowers on the skip laurel hedge. I chose skip laurels for the white border garden because of their white blooms and dark green foliage--a great backdrop for all the white flowers in this garden. We planted white periwinkles under the hornbeam trees two years ago. They seem to be taking off. Last year, they suffered from a fungal attack. Fingers crossed! 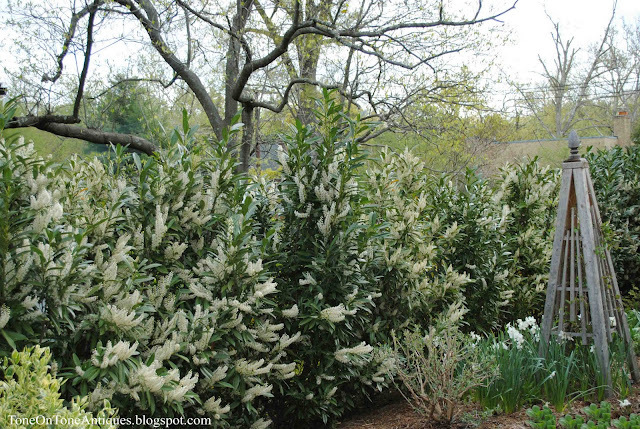 Remember the Clematis Paniculata that covered this tuteur last year? I recently gave this vigorous climber a good haircut as it had grown so much. 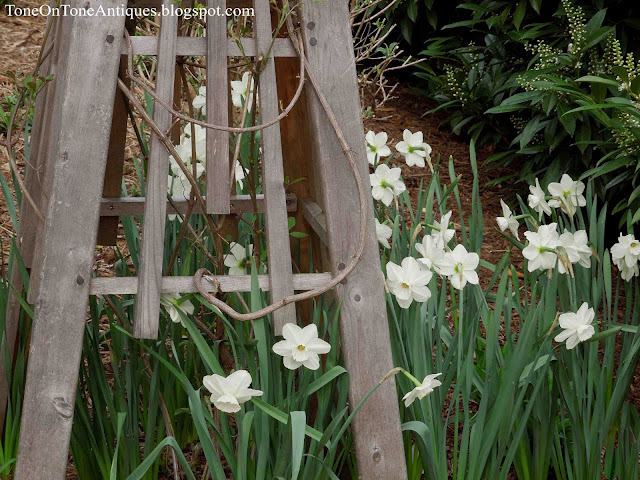 Under the tuteur I've planted another favorite daffodil of mine: Stainless. 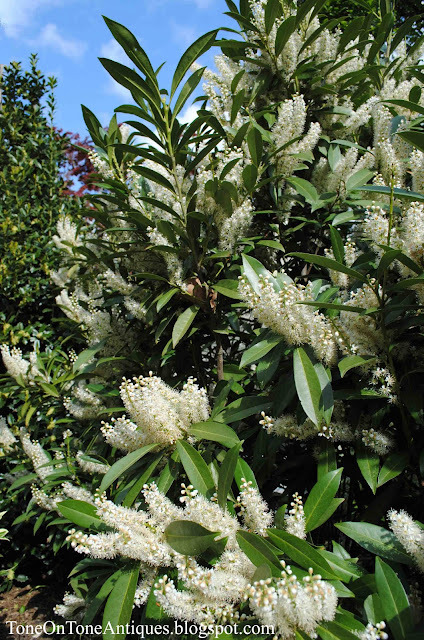 I love its clean, pure white flowers. Let's Go Antiquing in Paris! Our new spring shipment has just arrived! 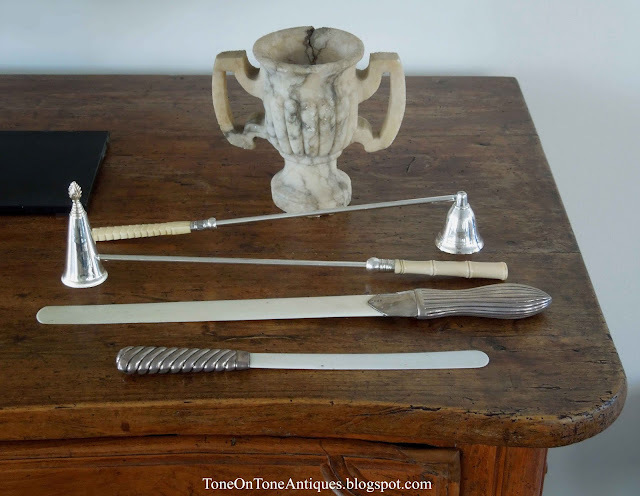 A formal preview to come after we've unpacked and cataloged the pieces. 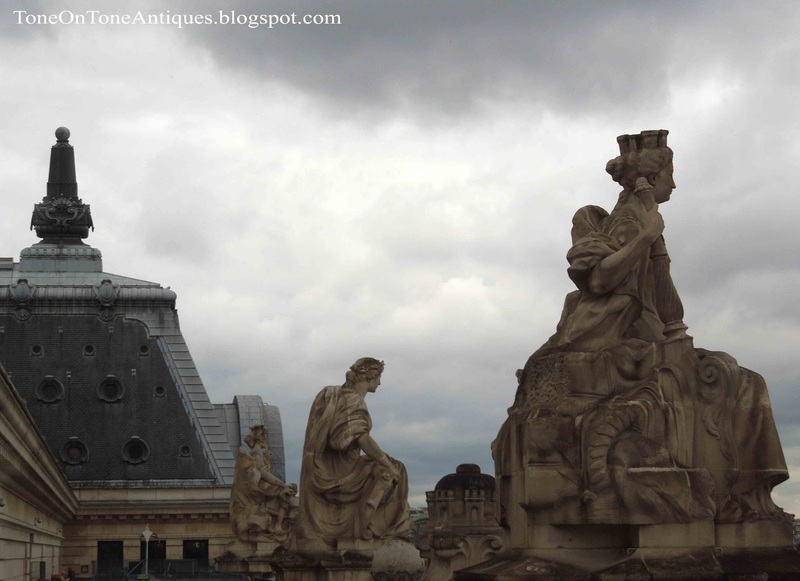 But first, I am taking you to the famous flea markets in Paris. I'll also share a few tips and professional advice on how to successfully shop the markets. 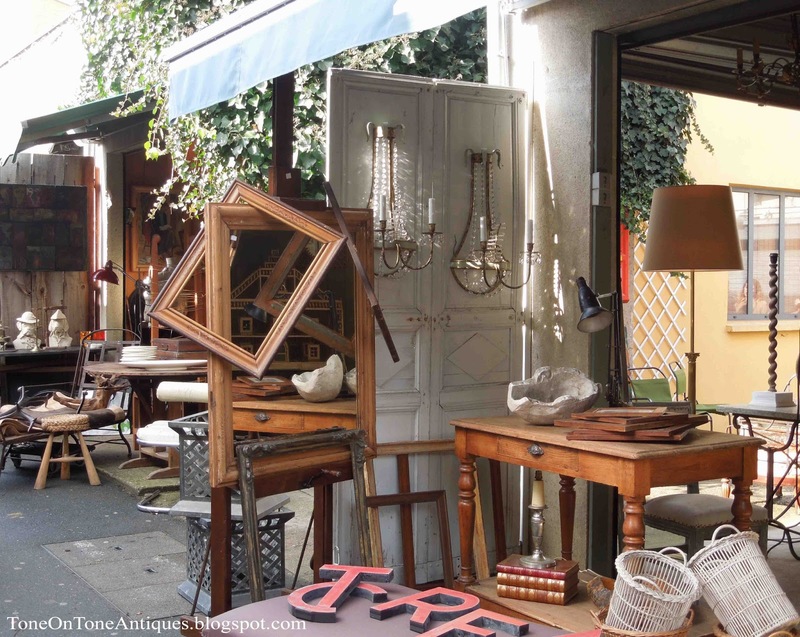 Located at Porte de Clignancourt and officially called Marche aux Puces de Saint-Ouen (but commonly known as "Les Puces" by the trade and Parisians), it is one of the largest antique markets in Europe. How many of you have been to Les Puces (translated as the fleas)? Whatcha think? Tom and I love it! We've been buying at the Puces for over ten years.....usually twice a year, and even before we had a shop. You can metro, cab or drive there. We usually drive and park in one of the garages as we're short on time. You can cruise around for a coveted parking spot, but keep in mind many are reserved for residents. Tip: Skip the upgrade to an oversized car and get a compact for easier navigation and parking. If taking metro, be careful once you approach the outdoor vendors selling clothing, handbags, etc. This area is not the Puces. 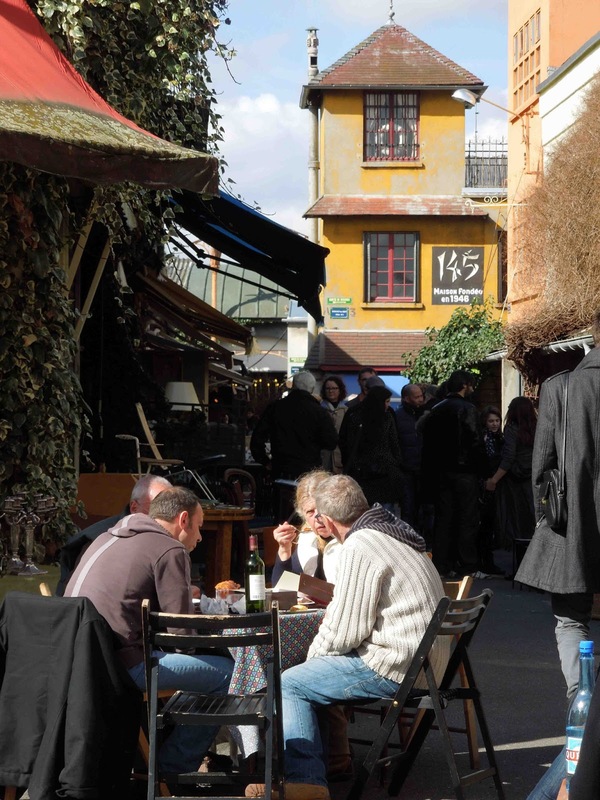 It gets crowded, and pickpocketing is common as this is not the best neighborhood in Paris. Therefore, I highly recommend taking a cab!! 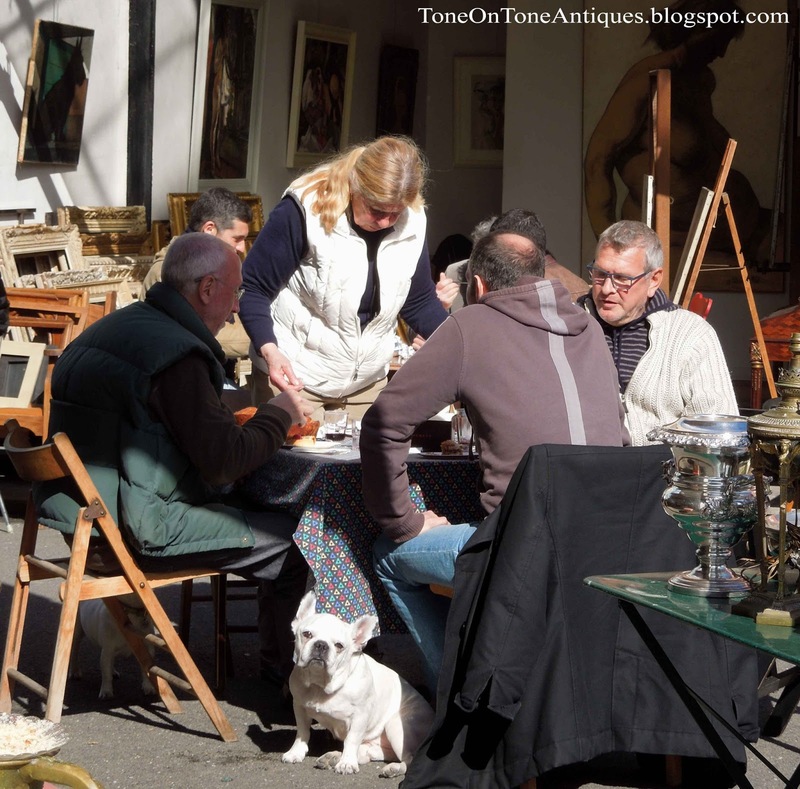 There are many different antique markets at Saint-Ouen. Each has its own flair, character and charm. 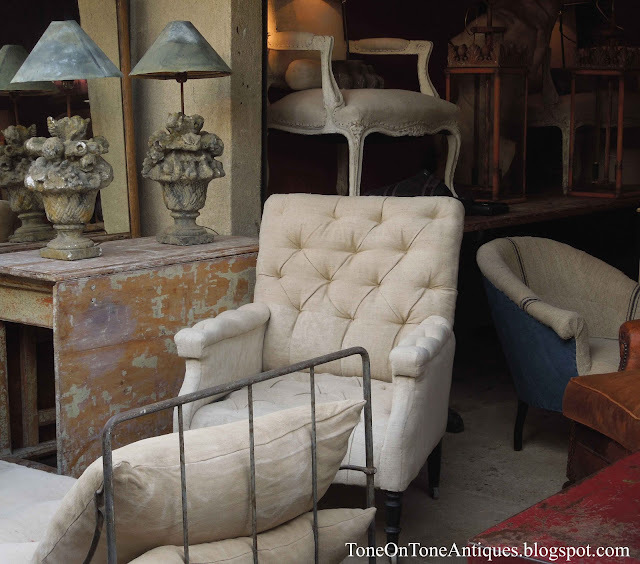 Marche Biron has classic French antiques, fine artwork and dripping crystal chandeliers. 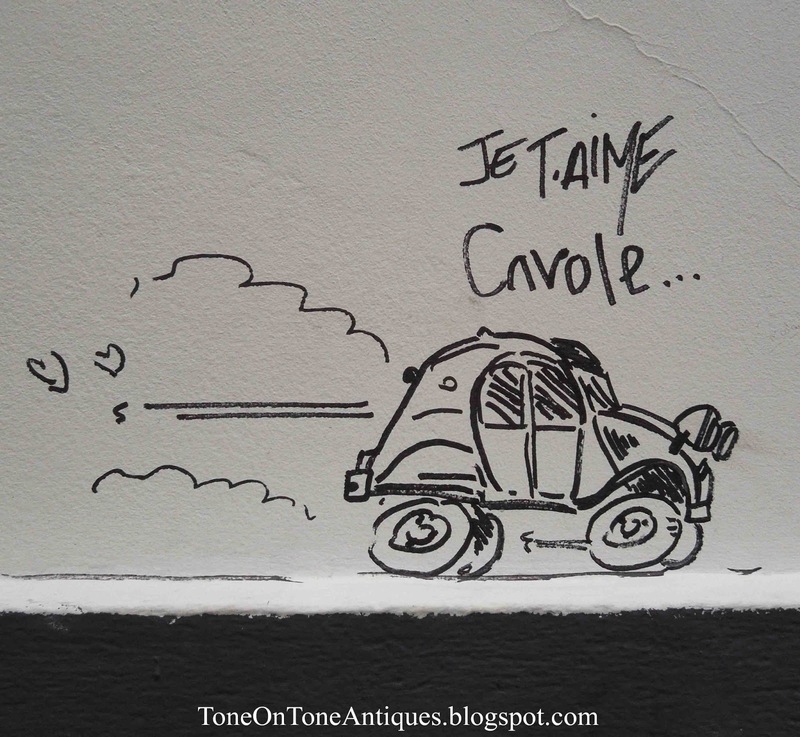 Biron can be pricey. Marche Paul Bert is one of my favorites. Again, it is not inexpensive. 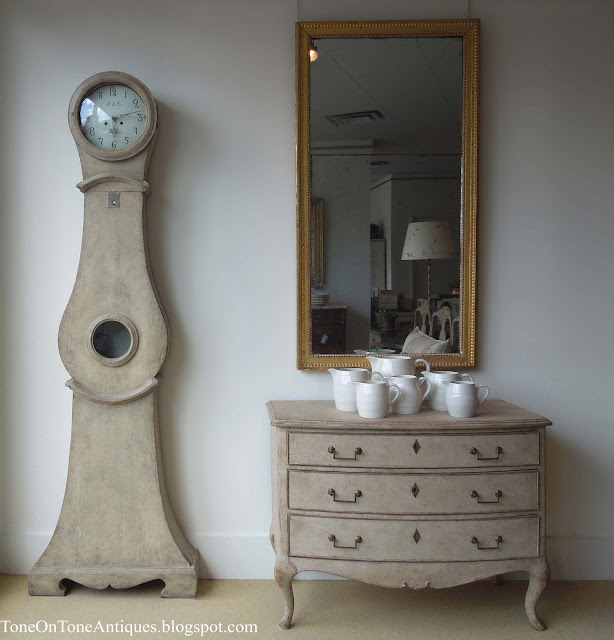 Marche Serpette has some of the best antiques and designer furnishings such as Maison Jansen, Bagues, etc. Tres chic! Marche Vernaison is fun, eclectic and touristy. You will find bargains, vintage clothing, paintings, furniture and the unexpected at Vernaison. To see a complete list, go here. Tip #1 - Go early to beat the crowds and get first dibs. It can get really crowded in the afternoon. 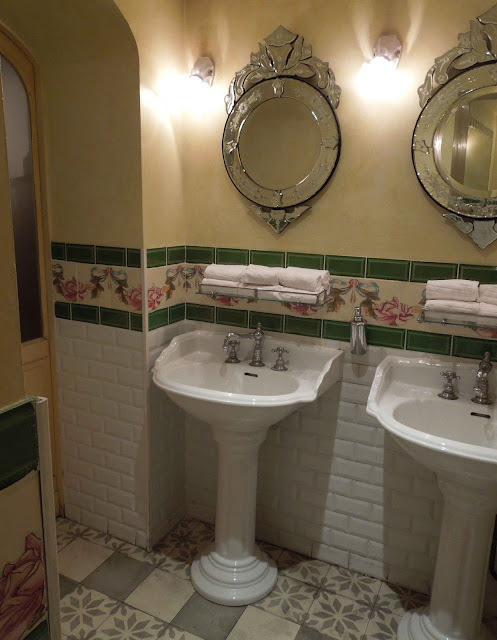 I really liked this stall. Check out the Swedish painted dropleaf table, painted apothecary style chest, campaign iron daybed and clubchair reupholstered in vintage homespun linen with tufting. 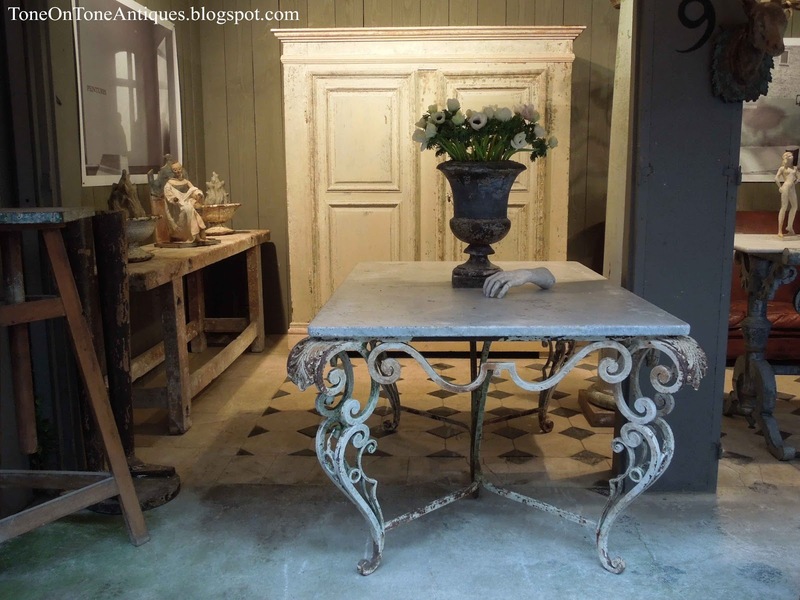 How could I resist this small French Directoire trumeau with its classical style frieze, pilasters and original painted surface?? The mercury glass is heavily foxed...just the way I like it! Look for it on our website soon. 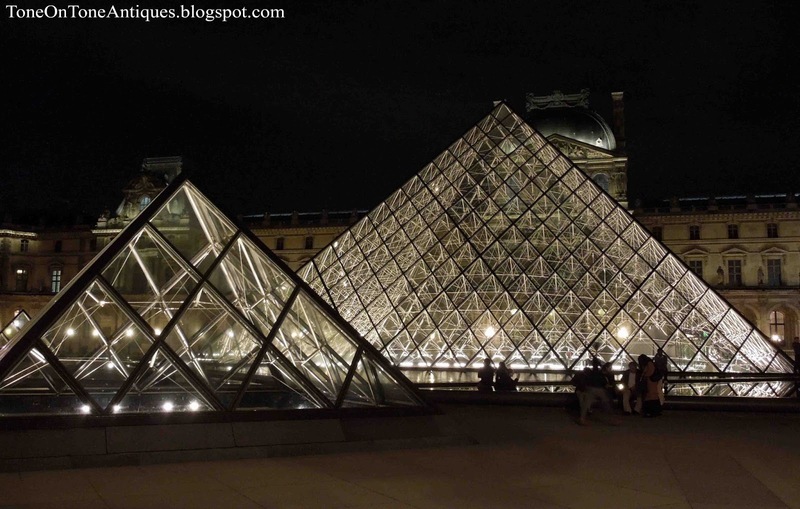 Tip #3 - Always ask before handling, and oh, mind your handbag, backpack, umbrella, etc. Not all shops / stalls are as neat and tidy as the above. Many are packed! Ahhh, lunchtime! 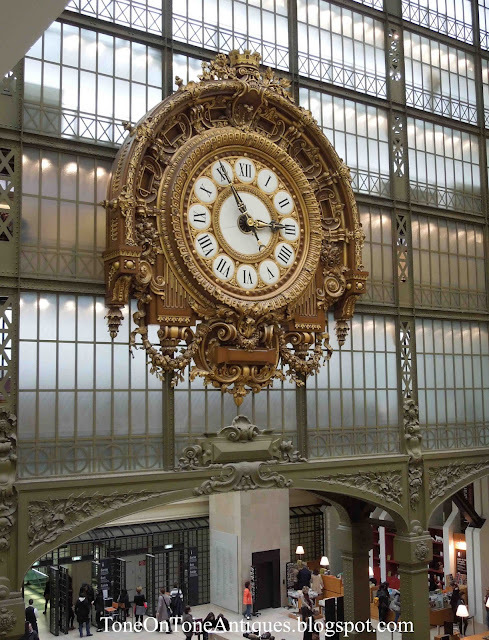 You will see the dealers picking up their baguettes, cheese, pate and wine. They will enjoy a fabulous lunch and still conduct business. So do interrupt if you have a question about an item in their stall. Above: How many doggies can you find? 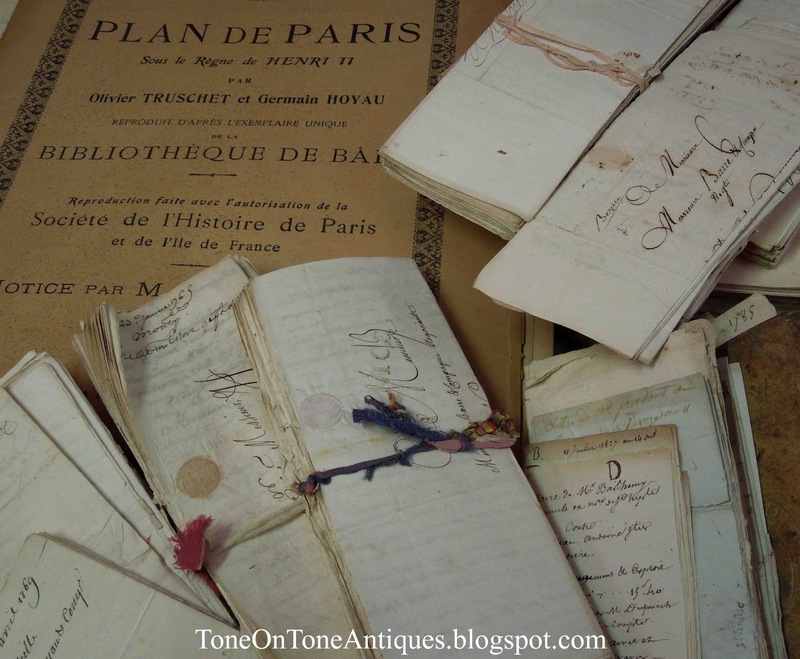 Look at all those Montparnasse carved wooden frames - so French! 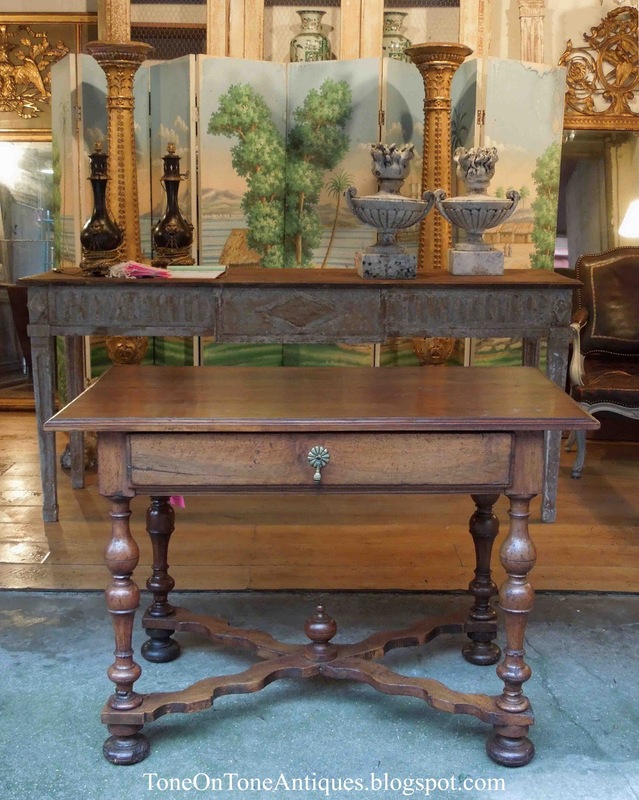 Above: This early 19th century French walnut table with its mellow patina spoke to me. I love the undulating "X" form stretcher. It is one of my favorite pieces in the new shipment. 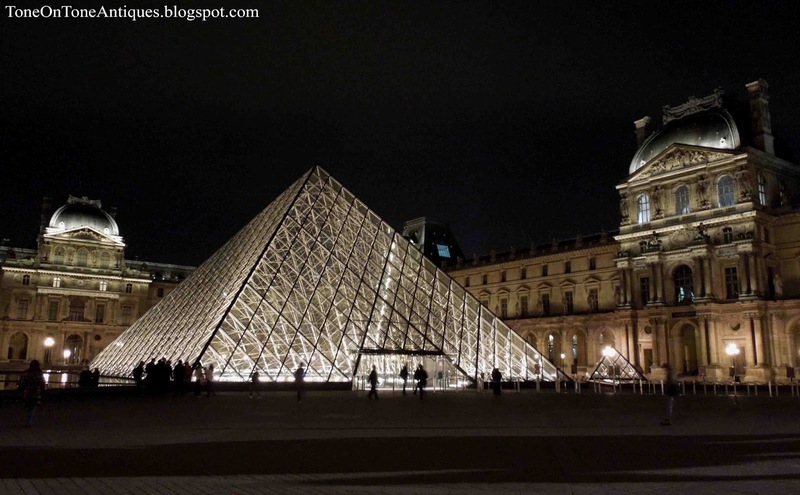 Tip #4 - Line up a shipper in advance if you anticipate buying large items that can't be carried home on the plane. 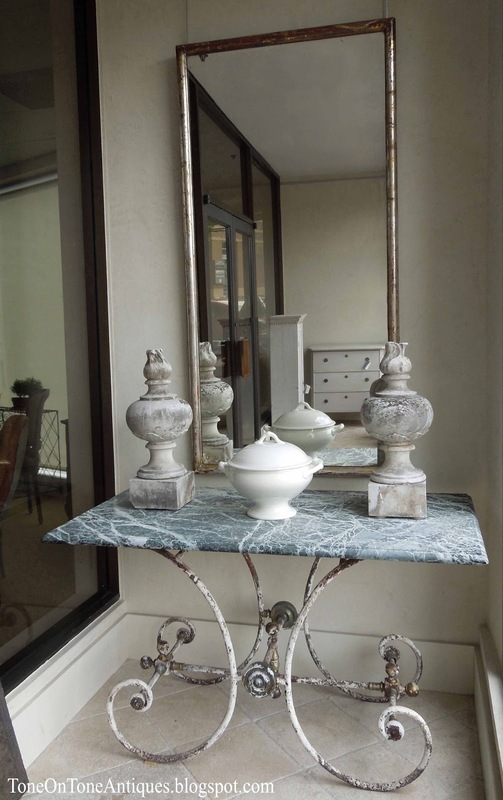 Tip #5 - Crate fragile items such as chandeliers, mirrors, marble tops and barometers - definitely worth the investment. Tip #6 - When buying artwork, don't be afraid to take the piece outside to examine in natural light. (Of course ask first.) 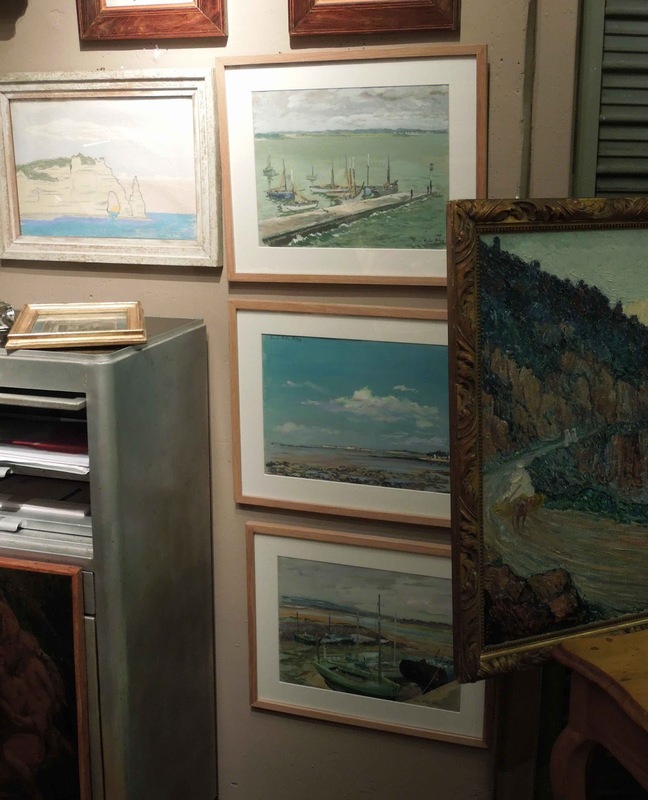 That dingy looking painting in the dark corner could be a gorgeous gem! Tip #7 - Don't be afraid to negotiate prices. Do so politely and confidently. And know when to stop. 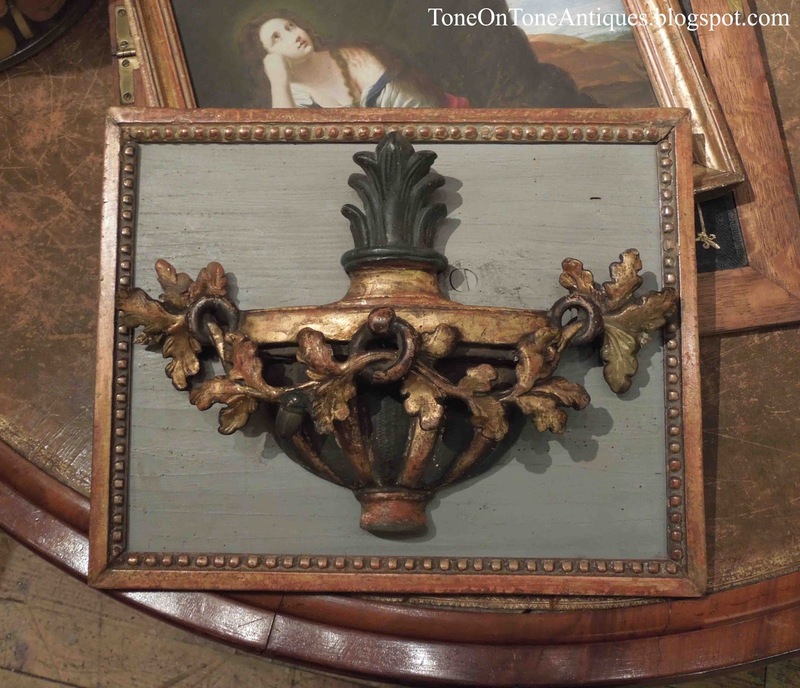 I really, really wanted the above 19th cen French boiserie panel, but it was just out of my budget. After negotiating for a while, I had to walk away :( But I did buy a terrific landscape painting from that same dealer.Win some, lose some! Perfect for Halloween! 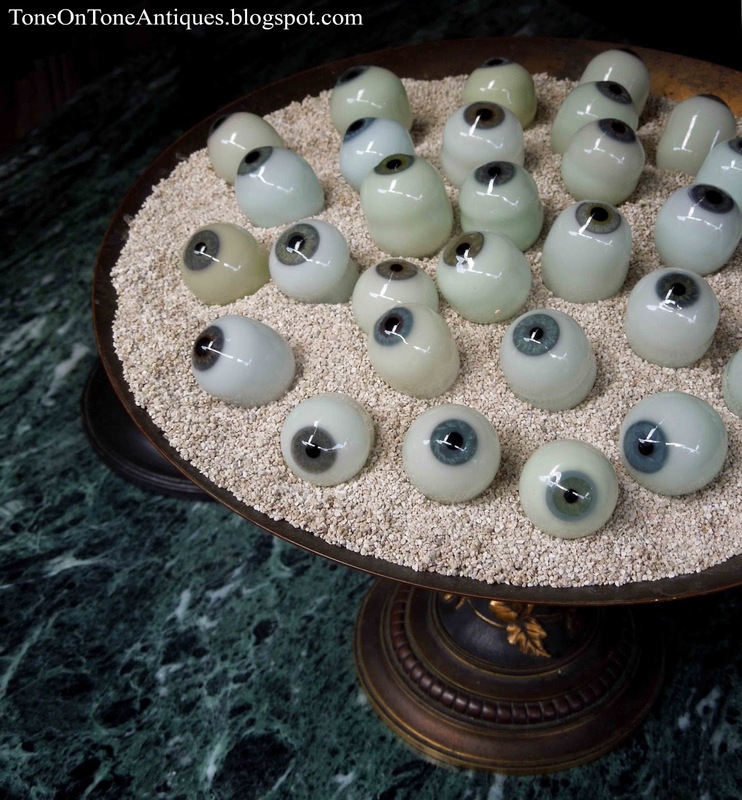 I meant to go back for these glass eyeballs but forgot. My guess is that they aren't old. Anyone know where I can find a few? Even the graffiti in Paris is charming! After the Puces, a visit to one of our favorite museums: Musee d'Orsay. 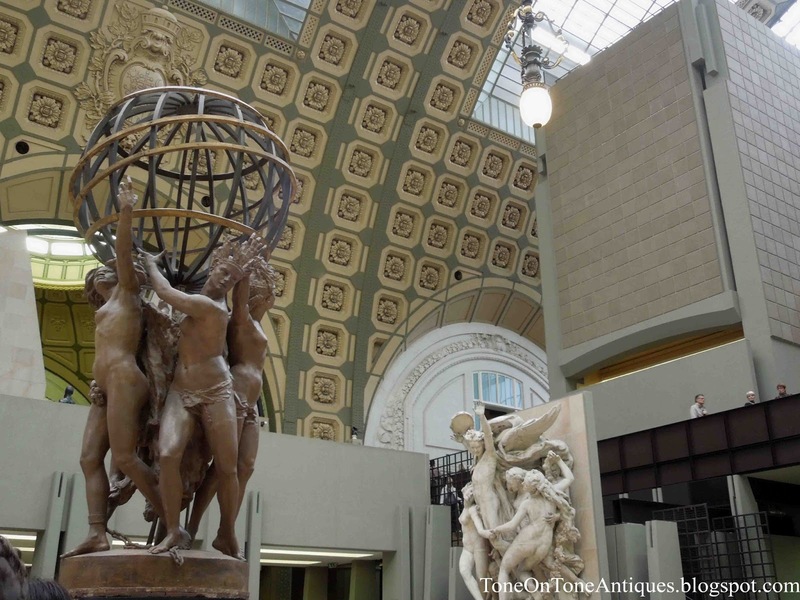 This magnificent Beaux Arts building was once a train station. 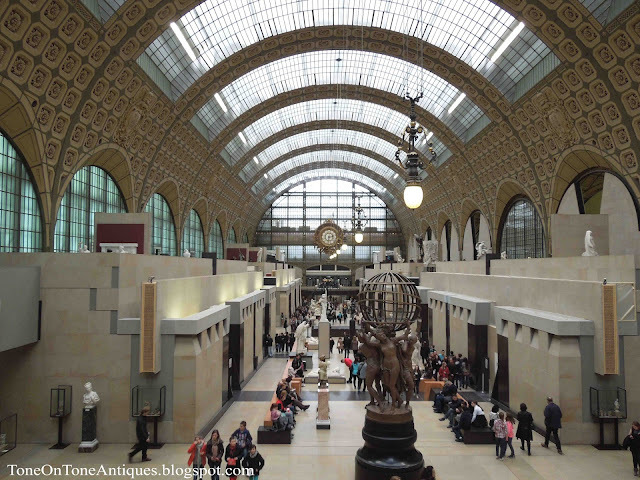 Enjoy the impressive collection of Impressionist paintings and panoramic views of Paris from the top floor of d'Orsay. 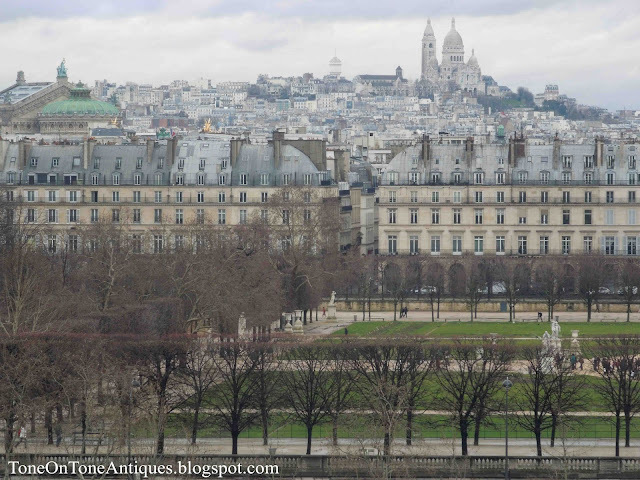 In the distance is Montmartre. 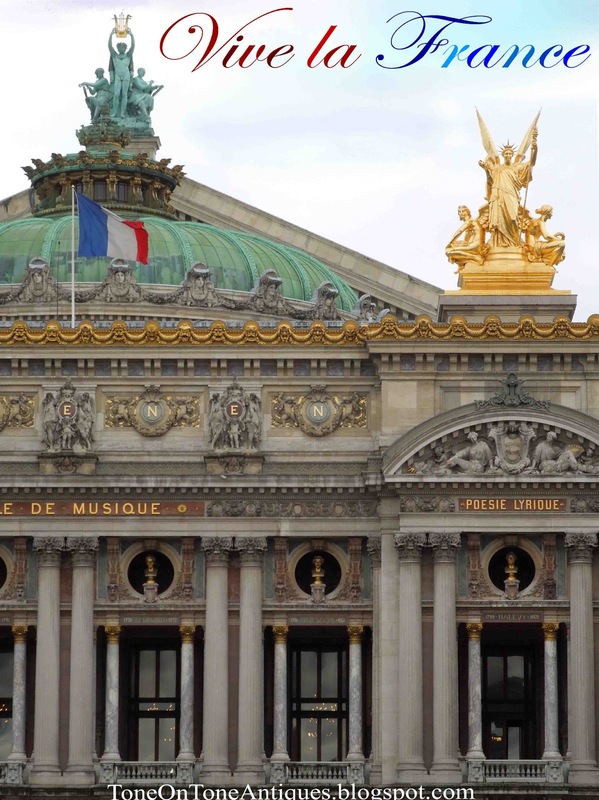 Paris is full of fabulous restaurants, and we love trying new ones. 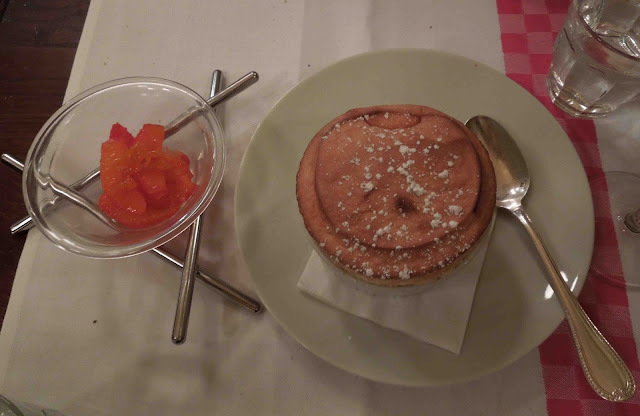 I asked my blog friend and talented chef Ivan of A Normandy Kitchen for a restaurant suggestion. 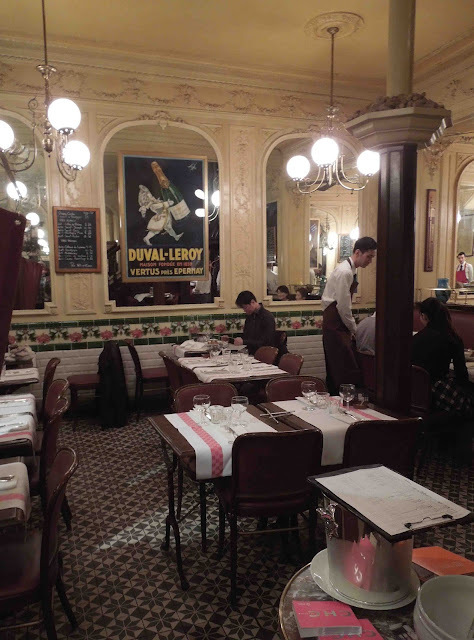 Ivan suggested Aux Lyonnais, an old Parisian restaurant now owned by Alain Ducasse. Being Americans, we ate early of course! The food was absolutely divine! 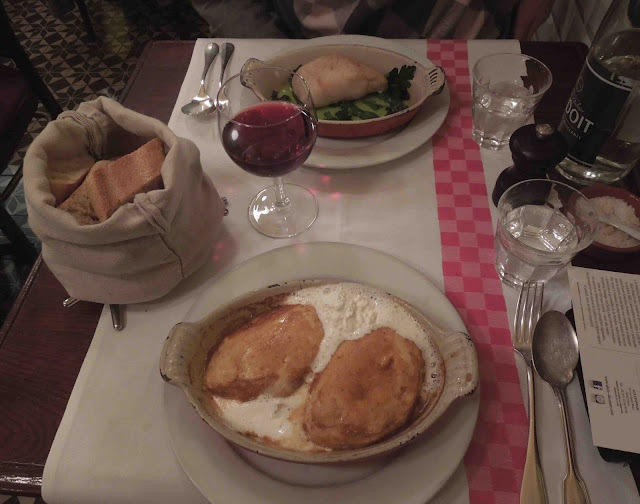 For my main course, fish dumplings in a rich but very light (how do they do it?) crayfish sauce with creme fraiche. Tom had pollack with an asparagus sauce. For appetizers, we had pate and foie gras. As we always do on the last night of each Paris trip, we visited a few iconic monuments and sights. 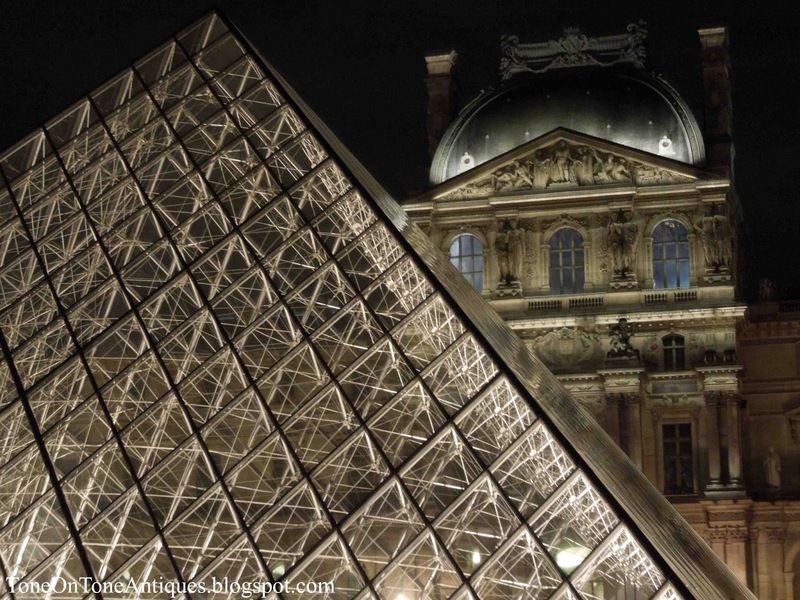 Seeing the Louvre at night - magical!